Politicians and law enforcement officials in California will introduce a bill on Friday that requires all smartphones and tablet PCs sold in the state be equipped with a digital "kill-switch" that would make the devices useless if stolen. The bill is a response to a rise in thefts of portable electronics devices, often at knife or gunpoint, being seen across the state. Already half of all robberies in San Francisco and 75 percent of those in Oakland involve a mobile device and the number is rising in Los Angeles, according to police figures. The trend is the same in major cities across the U.S. and the California bill, if it passes, could usher in kill-switch technology nationwide if phone makers choose not to produce custom devices for California. California Senate bill 962 says all smartphones and tablet PCs sold from Jan. 1, 2015, should have "a technological solution that can render the essential features of the device inoperable when the device is not in possession of the rightful owner." The proposed bill, a copy of which was seen by IDG News Service, doesn't specify the kill-switch technology. Carriers or phone makers will be able to design their own system in software, hardware or a combination of both, but once activated it should prevent phone calls, Internet access and the ability to run apps. It will have to be resistant to a hard reset, attempts to return the device to factory condition or a downgrade of the operating system. Users should have the option of deactivating it if they don't want the protection, but retailers will be banned from offering such a service. The bill proposes retailers will be subject to a fine of between US$500 and $2,500 per device sold that doesn't include the technology. The fines won't target private sellers of second-hand phones. 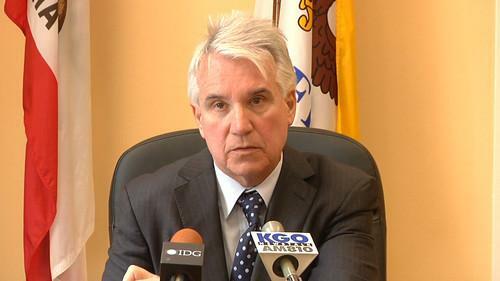 It will be formally introduced in San Francisco on Friday morning by State Senator Mark Leno and San Francisco District Attorney George Gascon with the backing of the mayors and police chiefs of San Francisco, Los Angeles and Oakland. Gascon and New York State Attorney General Eric Schneiderman have been leading a push by senior law enforcement figures to make smartphone makers address theft of their devices. The work has targeted Apple, Samsung, Google and Microsoft and has already had some success. Shortly after Gascon brought representatives of the four companies together, Apple introduced its iOS7 operating system with an activation lock feature. Samsung also responded to his call by installing the "Lojack for Mobile Devices" software on some of its phones, but it requires an annual subscription. The bill is due to be heard in the California senate in the coming months.